Mound Hill Cemetery began with a 4 acre tract, donated by Eaton's city founder, William Bruce. This area is located in the northwest quadrant of the cemetery on West Main Street. The first known burial was that of a young girl who succumbed to whooping cough in September, 1806. It is notable that the city was founded that same year. Mound Hill Cemetery was named for the prehistoric Indian mound which lies within. The mound now holds the remains of 15 soldiers of General Anthony Wayne’s army, killed in an Indian attack on October 17, 1793. The remains were moved from burial sites at Fort St. Clair and re-interred in the mound on October 1847. At that time, a beautiful 10ft. monument of Rutland Marble was erected by contributions from the community and placed atop the mound to honor these fallen soldiers. Known as the "Eaton Cemetery" in the early years, a committee was formed in 1847 to give the cemetery a more prominent name. Mound Hill Cemetery was chosen as an appropriate name, not only in point of beauty, but also in local significance. The 'old cemetery' encompasses all the charm and history one would expect from a cemetery of this age. After a century of activity the trustees of Washington Township realized the need for more land to carry on Mound Hill Cemetery’s service to the community. In 1907, 33 acres of ground was purchased just south of West Main Street on Camden Road, across from Fort St. Clair Park. The 'new cemetery' was opened in 1928 and is actively utilized today. Washington Township Trustees had soul jurisdiction and responsibility for Mound Hill Cemetery until 1961, when it was annexed by the city of Eaton. Mound Hill then became a "union" cemetery, funded jointly by the township and the city and operated as a public owned entity. 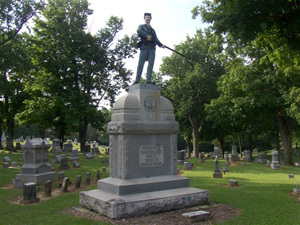 In 2010, Washington Township seceded from the union cemetery operation turning all property and control over to the City of Eaton. Mound Hill Cemetery purchased an additional 40 acres of ground in 2003, located on West Main Street at the city limit; we are actively planning our future expansion and continued service to the community.